Paper session: Conforming to the presentation time limit is critical. Each paper session is allocated 20 minutes for presentation and 10 minutes for questions and discussion. Session moderators will have timekeeping cards. All presenters using PowerPoint or the internet for their presentations should do a test-run and preview their presentation on the equipment in the presentation room in advance (e.g., in the 30 minutes prior to the first morning session in that room or during lunch) to make sure there are no technical problems. We will have tech support volunteers on hand for assistance. Any volunteer in a purple shirt can get a tech support volunteer for you. Please check your presentation rooms and prepare copies of your handout accordingly, if applicable. Each room will be equipped with an LCD projector, projector screen, laptop with Windows, internet connection, and external speakers. PowerPoint and web browsers will be installed on the computers. Microphones are available in the Keoni Auditorium, Asia Room, and Pacific Room, since they are larger rooms. If you have special fonts or special software for your presentation, it may be best to bring your own laptop. The projectors have HDMI connectors, so you can plug in your laptop to connect to them. If you experience difficulty, ask one of our tech support volunteers for assistance. Please send a request for any special tech needs via email to icldc@hawaii.edu by January 15 at the latest. (a) If your paper contains data, present it visually (e.g., PowerPoint presentation). Alternatively, you may wish to include it on any handouts you provide for audience members. You are strongly advised to make copies of your handouts in advance. In a pinch, however, there are a number of copy centers on and near campus (see E Komo Mai guide in your registration packet). (b) Consider keeping any review of literature or background information to a minimum, keeping in mind that you will only have 20 minutes for presentation of your paper plus 10 minutes for audience questions and discussion. Some presenters take nearly 15 minutes giving background information, leaving only 5 minutes to get to their main points or research results. Your primary focus should be on your own work and the implications it may have for your audience. (c) Focus on making several key points rather than the detailed and thorough analysis expected of a published paper. The idea should be to stimulate interest in your work and get some useful feedback and discussion from the audience. (d) We strongly recommend that you time and rehearse your presentation in order to comfortably fit it into your given time limit. Keep in mind that the audience is listening to your paper. If a paper is read word-for-word from a text (i.e., one prepared for publication), it becomes difficult to follow. (e) Finally, each paper has been accepted on the assumption that the study has been completed or will be completed by the time of the conference. If it turns out that your project is not at the point where at least some findings can be presented, we request that you withdraw. There will be two poster sessions, Thursday, February 28 and Saturday, March 2. Make sure you check which day you are presenting on. Posters should be set up by 9:00 am on your presentation day in the Garden Level Rooms (downstairs) by the windows. Volunteers dressed in purple will be on hand from 8:00 am to help with setup. Although posters will be displayed for the full day, the official presentation of posters will take place 12:30-2:00 pm on your assigned presentation day. During the presentation time, presenters will stand with their posters and interact with the audience. Posters should be taken down no later than 4:30 pm on the day of your presentation. Poster boards stand approximately 6 feet high. 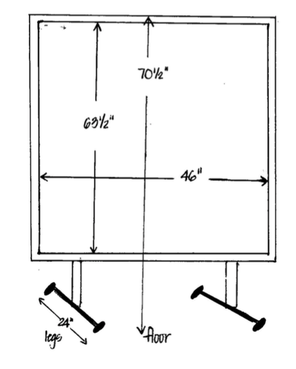 The maximum poster board dimensions are 63.5 inches high (161.3 cm) and 48 inches wide (116.8 cm). Posters should be designed to fit within the maximum display space. 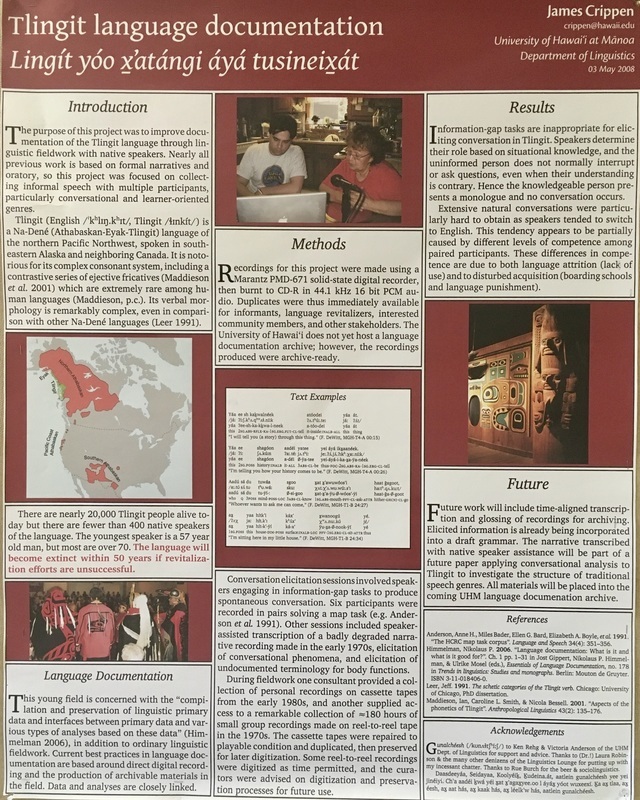 However, note that posters which utilize all of the vertical space may create difficulties for viewing (i.e., it is best to design the poster such that it can be viewed at eye level). Paper or laminated posters will work the best with the display boards, as these are easiest to affix with push pins; pins will be provided to help fasten your poster to the board. 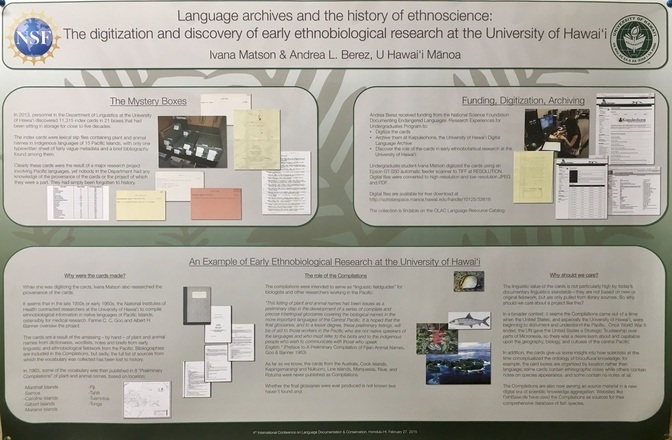 (a) A poster outlines all of the key points of your study briefly (e.g., the theoretical framework or important background information for your work, your research questions or hypotheses, your methodology, your key findings, and any implications your study might have). Because it is a poster, anyone who walks by and reads it should have a pretty good idea of the main ideas of your work. During your poster presentation period, they can come back, ask you questions, get more details, offer feedback, etc. Poster presentations are more informal than papers, and they offer a great opportunity for one-on-one interaction between speaker and audience members. (b) Posters should be printed out (not handwritten). They also often have pictures or charts summarizing data if applicable. Consider the poster board your presentation space, to be organized to your satisfaction. Some people may print a large-format, self-contained poster (many copy shops have large-format printers for this purpose). 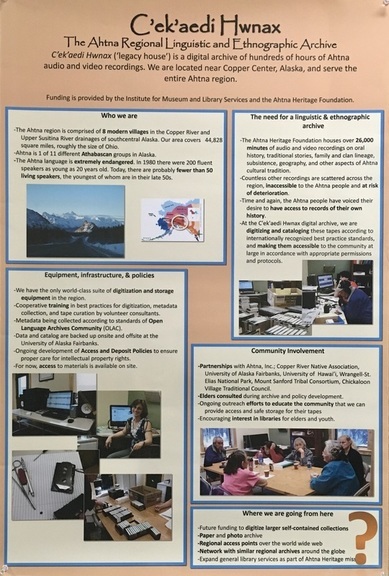 Some people print out each major section of their study on a separate piece of paper, along with additional elements, across the poster board to form their poster. (e) You may want to bring along handouts to distribute during the official poster viewing session. You are strongly advised to make copies of your handouts in advance. In a pinch, however, there are a number of copy centers on and near campus (see E Komo Mai guide in your registration packet). (a) Presenters will need to supply their own laptops (and other necessary equipment). (b) Each technology showcase will have HALF of a 6’ table (3’ X 2’) as well as HALF of a poster board (63” x 23”). Presenters can place their laptops and any other materials (e.g., handouts) on their half of the table. The poster board space is optional in case presenters wish to post supplemental materials, pictures, signs, and so forth on it. (c) Guests are free to browse presentations and stand with presenters to hear the presentation. (d) We recommend that you charge your laptop batteries in full prior to your Technology Showcase session for ease of mobility and placement on the table during your presentation. If your battery, however, is in danger of running out, we will have extension cords and power strips available, located behind the poster boards, for plugging in if needed. (e) Wireless internet access will be provided; however, due to the unpredictable nature of the internet connection, presenters demo-ing websites are strongly encouraged to download the sites to their local hard drives. Also, make sure you figure out how to connect to the wifi and operate all software/equipment ahead of time. (f) We will have some tech support volunteers on hand prior to and during the Technology Showcase period in case you need assistance. (g) We are sorry - due to space limitations, there is no room to do any projections. You should do your presentation via laptop or other mobile device (e.g., tablet). Also, the nature of the Technology Showcase sessions is to offer one-on-one demos, discussions, and feedback regarding your technology innovation. Presentation format is left open to presenters; they may range anywhere from software demos to static documents, slideshows, and multimedia displays, and possibly other formats. Handouts and promotional materials may also be made available to guests. Audio is permitted in presentations; however, if your presentation is noisy, please be mindful of neighboring presenters, and consider bringing headphones for guests to use.